The Muslim Rights Concern, MURIC, has attacked former President, Goodluck Jonathan, for removing the Arabic Ajami from the N100 note in 2014. The Muslim group said the action of the former President was a major failure of his administration. In a statement signed and forwarded to Newsmen on Tuesday by MURIC Director, Prof Ishaq Akintola, the group said Nigerians consider Jonathan’s N100 note as inferior to other printed earlier. The statement said, “The administration of ex-President Goodluck Jonathan officially issued the N100 commemorative centenary banknote on 19th December, 2014. A major feature of that banknote was the removal of Arabic Ajami. “Nigerians consider Jonathan’s N100 note inferior to others printed earlier. It is of very low quality. It tears easily. It lacks second hand value. It grows soft and fragile with time, thereby making it difficult to handle or fold in people’s pockets or wallets. It has therefore failed as a veritable means of exchange. Placed side by side with the old N100 note which still has the Arabic Ajami inscription and which is still in circulation, Jonathan’s N100 shrinks into oblivion. “The Muslim Rights Concern (MURIC) is constrained to affirm that Jonathan’s N100 note is a fiscal embarrassment, a huge disappointment and a colossal waste of the nation’s scarce resources. 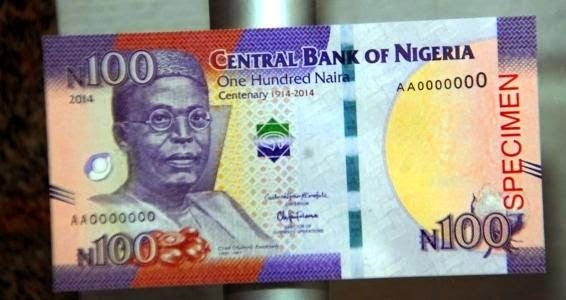 Three and a half years on, Jonathan’s N100 note has qualified for the worst banknote ever printed in Nigeria. It is a national disgrace. This banknote should be withdrawn from circulation. “It is not too difficult to guess what went wrong. Jonathan was blinded by his anti-Arabic sentiment that he ignored quality control measures. His only concern was to implement the hate agenda of a few anti-Muslim elements who are bent on eliminating all vestiges of Islam from the Nigerian environment. “It was not the first time this would happen. Arabic inscriptions which have always been on Nigerian currency since independence were unceremoniously removed in 2005 from N5, N10, N20 and N50 denominations during the reign of Olusegun Obasanjo. It must be noted that there has been surreptitious pressure from the Christian Association of Nigeria (CAN) for the removal of Arabic from the naira. “But Nigerians need to know that this move was calculated to hurt the Muslim population and may end up as a disservice to the nation. The average Northerner cannot read any other script except in Arabic Ajami and anyone who wants to communicate with him effectively must use the Ajami, not even writings in Hausa language can help in this matter. Millions of Northerners have therefore been marginalized by removing the Arabic Ajami from Jonathan’s poor quality N100 note and Obasanjo’s N5, N10, N20 and N50 denominations. “The removal of Arabic Ajami is being interpreted as an attempt to discourage the learning and use of Arabic language which is the language of the Glorious Qur’an. It is a sensitive religious matter. Nobody can do this in Nigeria and expect the Muslims to organize a carnival for him. But as usual, our leaders manifest the noun ‘deaf’ and the verb ‘to ignore’. “MURIC complained in 2005 when Obasanjo removed Arabic Ajami from new naira notes. The fact that Jonathan repeated the same thing has raised concern among Muslims. Why does Arabic always become the victim any time a Christian becomes president? It means that there is a conspiracy to gradually and tactically eliminate Arabic Ajami. It is only logical to expect the removal of Arabic from other notes when another Christian becomes president. ”Currencies worldwide are designed to suit each nation’s culture and history. Incidentally, Nigeria is a multireligious entity. In this case, therefore, our cultural and religious homogeneity should be the criteria, particularly when designing our banknotes, our stamps, etc. “But these two Christian presidents (Obasanjo and Jonathan) failed in this onerous task. They retained the English letters which symbolize Christianity and removed the Arabic Ajami which stands for Islam. It is simply bad leadership. They allowed sectional interests to override their avowed neutrality. What else is ethnic cleansing? We are all tax payers and to that extent we all deserve representation. “For the avoidance of doubt, we as Muslims are ready and willing to peacefully coexist with our Christian neighbours, but on equal terms. It must be with the proviso: ‘live and let live’. No more, no less. We believe that the religion of the president is of little consequence so long as he is fair to all. We will always address issues, not primordial sentiments and, by the way, our Arabic is very dear to us. It is tangential, not peripheral. This Muslim people too like trouble, when the Islamic write up was removed, did they use Christian write up to replace it? Foolish people, a;ways fuelling trouble. They are never satisfied. Certainly the ” professor ” must be of Islamic Studies not of philosophy or logic which are more intellectually tasking. How can he be pursuing such trivia as removal of Islamic inscription on the 110 naira note! Jobless man. There are a lot of funny characters in this our God-given country, Nigeria, these MURIC people are one of such people. Ignorance must be the second name of this group to believe that it is the absence of their “Arabic Ajami””, whatever that means,that made the 100 Naira note to be inferior. The stench of their ignorance must actually be approaching the high heavens for them to say that the English letters symbolize Christianity. They should please stop polluting the environment with their stark ignorance and go read the history and origin of Christianity. We need people who will solve problems and not one who want to win popularity by brewing more trouble. Muslims nd deir wahala sef,datz y herdamen/Hausaa is behaving like dat cos dey allow religion 2 take over deir thinking faculty,nd instead of dem 2 go 2 skool,dey prefer going 2 Arabic skool 2 learn wetin deir godfather leave 4 dem dere. Why are these people haters of peace? My heart bleeds for this nation! Which one do we take as the Prof’s reason for this outburst : that non-inclussion of Arabic writing makes it inferior ; a disadvantages to the people in the north ; or for religious reason? How does a citizen of another country be said to love and be more proud of another country’s language, Arabic of Saudi Arabia than that of his own country? Pity!